In a resistive touchscreen I am trying to read x-y position. The schematics is as followed. The code works fine and when I press a point, it reads correct position well but the problem is in standby ( when no touch ). 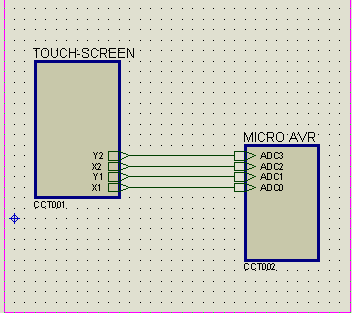 The ADC shows the middle of the screen both for x and y instead of reading zero ( around 512 in a 10 bit ADC reading ). I set a parallel 4.7 k resistor from X1 and Y1 to ground and the result is better ( it reads around 20 in standby) but I have not seen such design anywhere and dont know which value of the resistor is the best if this is the solution. 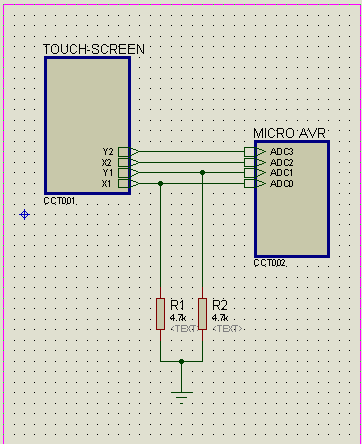 There is a good tutorial on resistive touchscreens by ATMEL here. In page 4, there is a table about the settings. I couldn't understand what Hi-Z stands for and I think the main result of my problem goes to that pull-up/int in the table for standby , but I couldn't find any sample code for setting a pull-up/int . What is that? should I clear SFIOR register PUD before reading and turning it off during the scan? Hi Z stands for "seemingly almost nothing connected", it acts as an open circuit, so you should take care of that situation if you want the other circuit to function properly. Also, by the looks of it, 4.7k seems to be right in this scenario, as it would mean ~1mA at 5V, which is usually tolerable by most of the devices. It seems it stands for interrupt - if the device is touched, and goes out of standby, it pulls the line low to make the uC aware that it is touched. The uC has to switch mode of that pin to ADC at that time, and then it can detect the coordinate. Hi Z is abbreviation for High Impedance (Z). Dont forget to use interrupt for touch detection. Not the answer you're looking for? Browse other questions tagged lcd touchscreen glcd touch-panel or ask your own question. How do I control a resistive touchscreen? Why is the conducting layer in resistive touchscreen placed perpendicularly? Resistive touchscreen - when measuring X, why doesn't Y affect the reading?